April 19, 2015 - The City of Santa Fe's Sustainable Santa Fe Commission recently announced that the Water Efficiency Rating Score's (WERS) Development Team won a Sustainable Santa Fe Award. The Commission bestowed the honor in the "Water Adaptation" category for "developing an accurate and flexible tool to drive water conservation in measurable ways". "We are truly humbled that the City of Santa Fe has recognized the WERS development team," said Mike Collignon, Executive Director of the Green Builder® Coalition. "It's a testament to the extensive work everyone has conducted to bring a practical water efficiency program to areas looking for assistance." The WERS program is a performance-based, interactive water conservation tool for new and existing homes. It uses a scoring scale of zero to 100, with zero being the most desirable. The program analyzes indoor water usage, as well as rainwater and greywater usage. The City of Santa Fe has passed a resolution calling for its addition to their green building code. The New Mexico legislature and Governor recently added a water efficiency requirement to their sustainable building tax credit and will look to the WERS program for assistance. Numerous communities and green building programs are looking to utilize this innovative program. Spring has not yet sprung and water already is headline news around the country. Not enough in California (http://www.newsweek.com/nasa-california-has-one-year-water-left-313647) or most of the southwest. Too much on the east coast of the U.S with record snowfalls recorded this winter. Now the word megadrought has entered our vocabulary (http://en.wikipedia.org/wiki/Megadrought). These decade-long droughts have forced mass migrations in the past and might again. We cannot plan on the weather changing and saving us. It is up to us to figure a way out of this situation. If the weather does change we will all breathe a sigh of relieve and be better prepared for the next drought. To stick our heads in the sand (i.e. I am not a scientist, but....) and not to plan leaves us ill prepared and no wiser than the civilizations that preceded us. So plan and implement we must. On a local, regional and national level, we must cut our water consumption. On a local level, it means implementing water conservation measures and promoting the use of alternative water sources whenever and wherever possible. On a regional level, it means determining the best way to recharge our aquifers and prioritizing the use of sustainable water resources. It means coordinating with our neighbors and understanding both the upstream and downstream consequences of our actions. On a national level, it means financing and communicating projects that work and penalizing old water-wasting habits that harm us all. It means prioritizing water as a national issue, and not just another problem that must be dealt with. On an individual level, it means getting involved. Asking your local water company and representatives what they are doing to ensure your "water security". What is the plan? What actions have they undertaken? Not just words, but concrete actions with objectives and measurements and timelines. Water is local. The solutions are local. Building pipelines to transport water from someone else's backyard is yesterday's solution. We must conserve what we have and re-use every drop two or three times. We must make smart, informed long-term decisions about what is the best sustainable use of the available water in our local is the future. We have the science, we have the technology, but do we have the will to overcome this challenge. We don't have to believe in global warming to know we are in the midst of climate change. Regardless of what is causing our changing weather, it just makes sense to be prepared. We can not wait for leadership, we must all get involved. Our economy depends upon it, our communities depend upon it, our families depend upon it. Water is the staff of life. We need to act as if we really believe it. There was a great piece in the New York Times recently on the price of water. The net of it was that water is too cheap. Of course, most of us are aware that the price of water is too low, but fixing the price of water - whatever that means - will not alone fix our water issues. Water, unlike most everything else, is a community issue only much more complex. 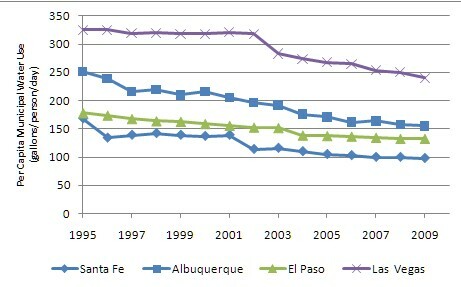 Santa Fe increased water prices over 40% over the last few years. There was no big public outcry, nor was there a large corresponding drop in demand. Santa Fe is a leader in water conservation and has had a multi-pronged conservation program in place for over a decade. These programs include: education and outreach, rebates, building and landscaping code regulations, and tiered pricing. As mentioned in the article, Santa Fe's innovative approach of requiring builders to bring water to the table is just one aspect of the City's water conservation program. The city's programs touch almost every sector within the city (e.g. hotels and tourist - restriction on how often linens can be washed; landscapers - restrictions on types of plants that can be planted; restaurants - serving water only on request; all businesses - water conservation signage must be posted in every public restroom; and residences - restrictions on when watering is allowed). Saving water is truly a community effort and the results show. But water unfortunately is not local. Saving water in Santa Fe is great, but the solutions need to expand to not just Santa Fe or any one community, but to the surrounding county, the state and the nation. We need to be involving all the regional stakeholders - communities, agricultural interests, large water users, small water and water utilities in these discussions. Water touches all aspects of our life near and far. We need it to live, but also for our power, our food, our clothing, our economy. A few communities in California are finding this out now that they have no water. The wells are dry and the streams are not flowing. Farms in southern New Mexico are now living with only one irrigation season. Dairy farms in Wisconsin are moving from one side of the state to the other due to water. Water is regional. People and businesses will follow the water. Who should use the water, who should save? Are local farms more important than truck farms in Mexico? Should communities go green power versus spend their indirect water budget on coal fired power plants hundreds of miles away? What does regional sustainable water use mean? Should sustainable communities think about how much water they import via goods and services? These are tough questions that previously did not have to be answered, but now are being forced to the forefront. The days of cheap, easy to access water are over. Now we need to start thinking about the future and how best to use our limited resources. Texas known for being the rebirth center of the modern rainwater harvesting movement over 20 years ago, is once again pushing the water conservation standard forward again. Although, not normally known for being environmentally friendly two recent news items out of the Lone Star State give us hope. San Macros, TX recently changed their rain harvesting codes to simplify the process, but also approved a rebate for rainwater catchment systems in a very meaningful way. Residential rebate are now up to $5,000 with rebates up to $20,000 for commercial systems. These rebates are for up to 50% of the installed system cost, not just a rebate on the cost of a tank. This is an industry leading rebate and coupled with the change of code should have substantial impact on the number of systems installed and the amount of potable water saved for years to come. And just down the way from San Macros, San Antonio is also pushing the envelope. They have significantly reduced water use over the past 30 years. Dropping water use from nearly 225 gallons per capita per day in the 1990s to 127 gallons in 2013, a 45 percent decline! This decline of use was mainly driven by new codes requiring low-flow toilets, faucets and appliances, but also very stringent outside watering restrictions - currently watering is allowed only once a week - enforced by off-duty police officers awarding stiff tickets. It is great to see this leadership once again coming out of Texas. Drought does create interesting times and as these two cities in Texas prove that being green is good for the environment, good for business and good for Texas - others are sure to follow. Per a recent article the Albuquerque Journal our Environmental Regulations are being reduced, not improved under the current Governor. "Groundwater provides the drinking water for 90 percent of the people in New Mexico. For that reason, whether the recently adopted regulation that addresses groundwater pollution by copper mines (commonly referred to as "the Copper Rule") adequately protects New Mexico's groundwater is a very significant issue." The article goes to explain how this new regulations puts our limited groundwater supply at risk. Good for cooper mines, bad if you happen to drink water and live anywhere near a mine. The new policy was bitterly opposed by a group of Silver City residents who live near copper mines; the New Mexico Attorney General's Office; the New Mexico Environmental Law Center; the conservation group Amigos Bravos; and Bill Olson, the contractor hired by the New Mexico Environment Department to help craft the regulations. New Mexico Attorney General Gary King and the New Mexico Environmental Law Center both have said they plan to appeal the decision. I urge you to support these efforts and write your representative and senator to ask why we are going backwards and not forwards. We have more data, more science, and more technologies to deal with these issues. We only have so much water. As stated by the Cabinet Secretary this law is stricter than the one in AZ or NV. That is a good goal. Let's make it as good as our neighbors, if at least we can't do better. Las Vegas water conservation: It's a mirage. Doug thank you for sending over the link to the Las Vegas water article. I totally agree with your comments - "the time to save water is not when the well is close to dry, it's before it is getting close to dry". Wise words, I hope we take to heart everywhere in the west. Yes Las Vegas has done some very interesting things to save water (i.e. outlawing new lawns, mandating fountains use recycled water, etc. ), but still uses an astonishing amount of water (i.e. 199 GPCD). The entire west is in the midst of a multi-year drought that shows no sign of wanting to save us from our water wasting ways. Las Vegas, Phoenix and South California are all in the bulls-eye. Although it seems like Las Vegas is trying to push to the front of the line with their needs with some very big projects already underway and more on the drawing board. And although "the city has made major improvements in water efficiency, using about 40 percent less water per person over the past 25 years or so. The problem is the city's population has tripled over that same time, and total water usage is up (though down from its peak about a decade ago--an improvement due at least partially to the economic downturn). It's like a one-ton man patting himself on the back for losing 400 pounds. Great news, but there's still a long way to go." Additionally, the drought is forcing old agreements to be thrown-away - with neighbors against neighbors, farmers against city dwellers, businesses against everyone. Water is a finite resource and as more and more of us move to this arid section of the country, these lawsuits will grow in number and size. Not just in arid states like southern CA, NV, NM, AZ but in states like Texas where it rains in buckets and where well owners historically could pump as they wanted. Easy water is no more. A new day is upon us; one where water conservation, water reuse and water efficiency are topics we all will know what they mean and why they are important. A recent article in Choice Magazine reveals some interesting trends and attitudes on water usage in New Mexico. Below are a few excerpts from this excellent paper published by Brian Hurd. As is shown in this analysis, it is very possible for these communities in New Mexico to greatly decrease water usage, simply by targeting inefficient outdoor irrigation practices. No change in behavior required, just fix what is broken to save water and save money. These levels of water savings are probably not unique to New Mexico, but probably apply to all areas where the irrigation season is the peak water demand season. Communities throughout the arid western United States and in growing numbers in the relatively more water-abundant east are challenged by increasingly scarce water supplies, growing populations, and needed economic development. Communities desire secure, reliable water supplies, as well as a varied array of attractive public amenities including parks, open spaces, swimming and recreation facilities, public golf courses, and other water-intensive services. Water managers must balance these desires with the growing costs of system maintenance and expansion, all the while generating sufficient revenues to service these costs. Economic incentives--such as increasing block rate structures where per unit water prices are higher for higher volumes consumed and rebates for water-saving appliances, fixtures, and landscapes--alone do not appear to explain the relative success that communities have achieved in reducing per capita water use. Resistance to higher water rates and limited program resources for financial incentives means greater reliance on noneconomic approaches and public appeals for wise-use and 'correct' behavior. Irrigating the urban residential landscape usually accounts for 40-70% of household water use. Additionally, residential landscapes receive 30 to 40% more water than typically required by the common types of plants and grass. Estimates of potential water savings range from 35% to 75% of current per capita water use based on a typical home with a traditional bluegrass type landscape (Sovocool, 2005). Improvements in the efficiency of landscape irrigation could yield significant water savings and is properly the focus of municipal water conservation programs. Continue reading Water-Conserving Attitudes and Landscape Choices in New Mexico. Editorial: Why not harvest rainwater? Rainwater harvesting is not just happening in the US, it is a worldwide event. Folks are noticing the changing weather patterns which in some cases mean more severe rain storms and view it as an opportunity to adopt more sustainable methods. Below is a recent article from El Salvador where the city of Davao City has a rainwater harvesting ordinance, the writer is pushing for even greater adoption of the practice. In Asia rainwater harvesting had been common for decades but forgotten. It is now being rediscovered. For example, in Korea it is being promoted as a solution to ongoing water shortages in remote areas. In China, it is a growing solution to a pressing water problem. And in Europe, a court ruled that laundry can be washed with rainwater thus providing even a greater market for rainwater catchment systems. In the US, where it seems we lag and then leap ahead of other markets, rainwater harvesting is slowly moving forward with little to no federal support and in most cases no state level support. Just imagine what would happen to this market with just a little support from our elected politicians. Today's article in the New York Times highlights the critical importance rivers play in our national water system. This article is specifically about the Western United States, but rivers across the country are diminishing and increasingly adding risk to our water supply future. The Rio Grande river is now a fraction of it former self and without the diversion from the Colorado River through the San Juan / Chama diversion the river would not even reach Albuquerque. The drought in this area has reduced upstream Rio Grande reservoirs to historic low levels. From the Klamath in Oregon to the Chattahoochee in the South, rivers are becoming more and more over-allocated and thus fueling conflict in neighbors with competing rights. River water is just one of our sources of water, with ground water being another. Rivers and the impact of over drawing and diminishing supplies are quite visible. Not so visible are our ground water supplies, and yet these supplies are also diminishing below our very feet. Water is key to our quality of life and our very survival. It needs to be a very high priority. Driving blind and being wasteful is not a good long-term survival strategy.